Richard Curtin has directed the University of Michigan's consumer sentiment surveys for more than four decades. His analyses of recent trends in consumer expectations are regularly covered in the worldwide press. 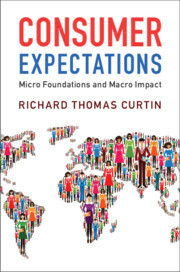 In this book, Curtin presents a new theory of expectations. Whereas conventional theories presume that consumers play a passive role in the macro economy, simply reacting to current trends in incomes, prices, and interest rates, Curtin proposes a new empirically consistent theory. He argues that expectations are formed by an automatic process that utilizes conscious and nonconscious processes, passion and reason, information from public and private sources, and social networks. Consumers ultimately reach a decision that serves both the micro decision needs of individuals and reflects the common influence of the macro environment. Drawing on empirical observations, Curtin not only demonstrates the importance of consumer sentiment, but how it can also foreshadow the cyclical turning points in the economy. Richard Curtin is the Director of the Surveys of Consumers at the University of Michigan, where he has worked for over four decades. His analysis of recent trends in consumer expectations are issued twice monthly and are regularly covered in the worldwide press. Data from the surveys are included in the U.S. Index of Leading Economic Indicators. During his career he has consulted with a number of countries, helping them to establish comparable consumer surveys, as well as a wide range of U.S. and international businesses and financial institutions. He received his BA from Michigan State University and his PhD in economics from the University of Michigan.